lighthouse that the U.S. airship Akron was wrecked in 1933. IN daylight the contours of a far-off coast enable the navigator approaching from the open sea to check his ship’s position, and alter his course, as necessary, for port. But at night he must rely on the lighthouse for his approach or landfall. At sunset each lighthouse must send out to sea a distinctive beam. No towering landmark is more eagerly looked for than the up-flung flashes of such a lighthouse as the Fastnet (off the south-west coast of Ireland) or the Lizard (Cornwall). Wireless telegraphy development has enabled modern ships to establish their positions when approaching land by means of wireless signals and direction-finding equipment. Despite this innovation the lighthouse is still the supreme beacon for every ship. Lights such as those at Ushant, the Fastnet, the Lizard, Cape Finisterre and Cape St. Vincent are vital guides on ocean highways. The vast majority of lighthouses have signals to fight the dreaded fog which obscures the most powerful light. Details of latitude and longitude, elevation and timing of each light, are given in lists of publications such as the pilot books and charts carried by all ships. Landfall lighthouses, always of the latest design, have the widest ranges. Coastal and warning lights serve a different purpose. They are designed chiefly so that each one can be quickly and easily distinguished from its neighbour. Harbour lights are of a third type. Lighthouses not only signal to ships by light and sound; some are also watch-towers that receive signals from ships and report the names of passing vessels to such authorities as Lloyd’s. Trinity House - to which a chapter will be devoted later in this work - is responsible for the majority of lighthouses and lightships on the English and Welsh coasts, the Channel Islands and Gibraltar. The Commissioners of Northern Lights operate in Scotland, and the Commissioners of Irish Lights in Ireland. Certain ports have their own lighthouses. The cost of maintenance is defrayed from the light dues paid by shipowners. Lighthouses are costly to build and to maintain. The most expensive and difficult to build are those erected on wave-swept rocks. A famous lighthouse of this type is the Eddystone, fourteen miles south-west of Plymouth. The present tower is the fourth Eddystone lighthouse, and cost nearly £60,000. In lighthouses standing on isolated rocks the prime essential is strength, and granite is the stone preferred if it can be obtained. Sometimes the tower outlasts the rock on which it is built. This has been so with the Eddystone and the Fastnet. The action of the waves undermined the rock on which the third Eddystone tower was erected, so the fourth was erected some distance from it. Part of the third tower is still in existence. The original Fastnet Lighthouse was a cast iron cylinder. It was built on a pinnacle rising about 100 feet above low water. Despite this height the waves sometimes shot up the sheer face of the cliff and shook the tower. Huge seas pounded pieces out of the rock until the tower was undermined. A new masonry tower was built on a ledge below high-water level. The new structure cost £79,000. 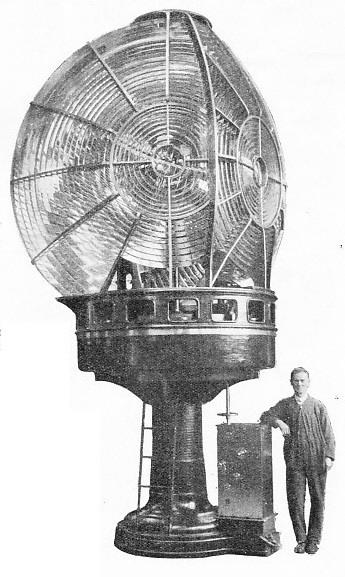 The focal plane of the lantern was 158 feet above high water. Before the present light was erected, the landfall light was on the land at Cape Clear, Co. Cork, but it was often obscured by fog - a fatal defect in a landfall light. It may seem strange that it is sometimes preferable to put a light close to the water instead of high above it on top of a cliff. In a clear atmosphere the higher the light the better, but practice has proved the danger of this in a climate such as that, for example, of Great Britain. The original lighthouse at Beachy Head in Sussex was built on top of the cliffs to the west of the present rock lighthouse, and was often obscured by fog that did not exist nearer sea-level. A new lighthouse had to be built near sea-level, some 500 feet from the base of the famous headland. To erect this light on a site covered at high water, a circular cofferdam was built first. This was pumped dry of water when the tide ebbed, and so lengthened the time available for the workmen to bring the base above high-water level. 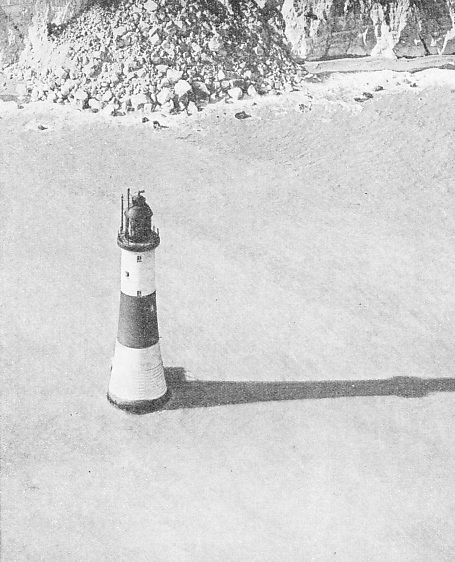 Materials were lowered from the top of Beachy Head by a cable-way, and the lighthouse was erected in about two years. Beachy Head tower is built of granite. The height of the light is 103 feet above high water, and this is more satisfactory than when the lighthouse was on top of the high cliff. The present lighthouse is far enough from the base of the cliff to make it safe from the falls of chalk that threatened the safety of the old lighthouse. This question of height is decided by the locality, and as a rule 200 feet is about the limit in areas subject to fog. AERIAL VIEW of Beachy Head Lighthouse, off the Sussex Coast. Where fogs are common, it has sometimes been found better to place a lighthouse close to the water instead of on the top of a cliff. The original lighthouse at Beachy Head, built on top of the promontory, was often obscured by fog that did not exist nearer sea-level. The present lighthouse has one white group-flashing light, visible sixteen miles. Group-flashing means showing, at regular intervals, a group of two or more flashes. The Beachy Head light shows, every twenty seconds, two flashes, each of seven-tenths of a second duration, separated by eclipses of two and six-tenths seconds and sixteen seconds respectively. The usual method of constructing a stone lighthouse on a wave-swept rock is first to erect a coffer-dam, or wall, round the site to prevent its being flooded by the sea; any water that breaks over the wall is pumped out. Because of the nature of the rock blasting is not always possible, and then pneumatic drills are used. The courses of masonry are cut so that each block is dovetailed into its neighbours on either side and also above and below it, the bottom layer being cemented and bolted into the rock. The blocks are shaped, fitted and numbered at a shore base and then dismantled and taken to' the site, where they are erected according to the numbers. This process of transporting the blocks to an exposed rock is a dangerous one in rough weather, and great care has to be taken to prevent the edges from being chipped, especially as some blocks may weigh several tons apiece. Even more exacting is the transit of the lantern apparatus. When this has been successfully landed on the rock, there remains the danger that a sudden gale may spring up and damage the parts of the apparatus before they are assembled in the security of the tower. The workmen have to be isolated for long spells, and quarters have to be erected so that they can live on the rock. The early stages of the work can only be done in fine weather. A famous light is the Bishop Rock Lighthouse, which, with those of Ushant and the Lizard, is one of the landfall lights for ships entering the English Channel. It guards the Scilly Isles. Situated in one of the most storm-swept parts of the Seven Seas and marking the western gate of the Channel, it is a triumph of perseverance after years of struggle against the might of the waves. The first tower was constructed on the screw-pile principle of cast iron tubes stayed with wrought iron rods, the idea being that this would offer little resistance to the waves. But after three years’ work, when the structure was ready for the lantern, a storm swept it off the rock. A granite tower was built. This was severely shaken by the storms, a fog-bell weighing 5 cwt. which was on the lantern gallery 100 feet above the sea having been carried away by a high-climbing wave. The tower was strengthened, but again gave cause for anxiety. This anxiety was not relieved until a practically new tower was built round it and the height raised so that the focal plane of the lantern is now some 40 feet higher than before. The cylindrical shape of the base of these rock lighthouses takes the blows of the waves at the strongest part of the tower, and breaks them so that only spray rises to the level of the lantern. This design is better than the former spreading base, which tended to throw the waves upwards, so that in storms they would strike the base of the lantern gallery with such force that the stones of the cornice were sometimes shifted. Iron lighthouses on the screw-pile principle are used to mark sands; they serve also as warning lights. They are really beacons on stilts, and are useful in estuaries where sand does not permit of a heavy structure that requires a solid foundation. A pioneer of this type was the Maplin Lighthouse which marked the Maplin Sands off the Essex coast of the Thames Estuary, but this structure collapsed a few years ago. Another of the same type is the Chapman Lighthouse in Sea Reach of the Thames, off Canvey Island. The legs are iron tubes having screw-threaded feet with broad flat-bladed screw threads which are screwed into the sand and braced together by a lattice-work of horizontal and vertical girders. Above the wide base the supports incline towards the body of the structure, which contains the quarters for the keepers and the lantern. This method is ingenious, as the piles offer the minimum surface to the currents and waves, and the body is raised above the reach of the sea. 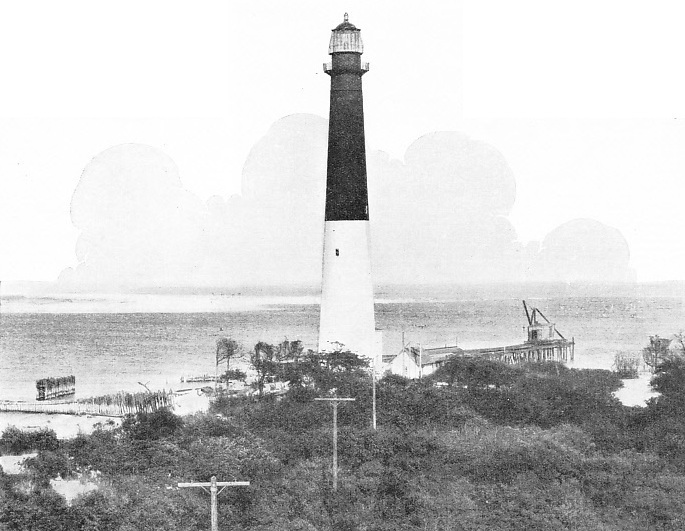 Such lighthouses are not suitable for exposed sites where the waves may rise high enough to subject the lantern to the danger of being swept away, owing to the resistance offered by the surface area, but they fulfil a useful purpose and are found in shoal waters, particularly off the Florida Coast of the U.S.A. Some lights are a compromise between a screw-pile and a tower lighthouse, and the focal plane of the light is more than 100 feet above high water. This type is useful also on coral reefs, and has done duty in northern estuaries where ice comes down with the tide at the end of winter. In this instance the screw-piles are protected from the onslaught of the ice by an outer breastwork of piles. IN A STREET. The unusual position of a lighthouse at Blyth, Northumberland. Blyth is a coaling seaport about twelve miles north-east of Newcastle upon Tyne. built the iron tower, the base of which was filled with concrete. A breastwork of brushwood mattresses and broken stone was built on the sand to prevent the tide from scouring the sand away. The Fourteen Foot Bank Lighthouse which marks a shoal in Delaware Bay, U.S.A., is of the same type. During construction the caisson shocked the engineers by taking a list and they realized that the sandbank was not level. They managed, however, to right the caisson by weighting the higher side with concrete until the weight forced it level. These lighthouses are near centres of civilization, where skilled labour and modern appliances are available. The problem of erecting lighthouses in places many miles from land is solved by building lighthouses of steel or iron plates, bolted together, erecting the lighthouse in the builder’s yard, and then dismantling it and shipping it to the site and re-erecting it. Important though the construction is, the light itself is more important. The lighthouse consists of the tower, the lens with its supporting pedestal, burner and accessories, and the projecting lantern. The lens, burner and accessories mark the modern development. It is upon this part of the lighthouse that scientists have concentrated, and a modern apparatus is the largest form of optical instrument in use. The early lighthouses were stacks upon which fires of wood or coal were lighted, these being followed by candles that were protected by glass from being blown out. It was not until oil lamps were introduced that it was possible to consider some means of concentrating the light and reflecting it. Smeaton’s Eddystone Lighthouse, wonderful structure that it was, merely showed the light of twenty-four candles; but while candles were used it was impossible to experiment with concentrating and reflecting the light because candles cause soot. When lamps were introduced and the soot problem was solved it became possible to experiment. A modern hyper-radial lens has an inside diameter of 8 ft 6-in, and the revolving part will weigh 6 tons. Yet, floating on mercury, it is so beautifully balanced that it can be turned by the pressure of a finger. So intricate as to be composed of 850 separate elements, and so efficient that it can give a flash of one and a half million candle-power every 7½ seconds, such an apparatus can be relied upon to function with the utmost reliability in any part of the world. After the unaided light, which depended only upon the number of candles or the size of the fire, the first step forward was the use of silvered glass fitted together to form a paraboloid. This was followed by silvered metal reflectors. The third stage was the use of glass lenses and prisms to magnify the light from a single source at their centre. Augustin Fresnel, a Frenchman, invented the stepped lens, and this was developed by his successors. The scientist has perfected the lens with the object of making each light individually distinctive to the mariner. There are, however, many difficulties. The eye-level of a fishing smack skipper would be only a few feet above the water, but that of the master of a giant liner a considerable height. The angle between the light and the eye of the observer is important. The curvature of the globe must be taken into account, and the risk of fog if the lighthouse is too high. Lights are fixed or revolving. Fixed lights must be visible all round, and only the light lost above in the sky or below on the land must be bent down and up to go to the horizon. Revolving lights do not have to illuminate the full 360 degrees of the whole horizon at the same time, but only each point at intervals. The rays are condensed horizontally as well as vertically, and form solid beams or columns of light. BISHOP ROCK LIGHTHOUSE, Scilly Islands, is one of the landfall lights for ships entering the English Channel from the west. The first structure, built on the screw-pile principle of cast iron tubes stayed with wrought iron rods, was swept off the rock. Then a granite tower was erected ; later a higher tower was built round this. The lighthouse shows one white group-flashing light, with two flashes every fifteen seconds. The revolving lenses concentrate the light from the burner, and at intervals flash it round the horizon, and also down to the sea and up into the sky in a way that no solid fixed lens could do even if it were possible to manufacture one of sufficient size. A fixed light has a limited range, but a revolving light is more effective ; a mariner a long way out at sea does not see the light itself, but sees the reflection in the sky. The reason is that the curve of the earth is between the mariner and the lantern so that it is impossible for him to see the structure, but he can see its reflection. If the fixed light were allowed to shine all round the horizon its identification would be difficult; thus the light is occulted, or cut off for a period by revolving a screen round the lamp or by lowering a cylinder over it. By altering the spacing of the screen different periods of eclipse can be arranged. Similarly with the revolving light, the arrangement of the flashes is determined by the position of the lenses. At first all revolving lights showed single flashes, the lenses being evenly spaced, and then the group-flashing system was evolved. This is achieved by arranging the lenses unevenly in groups, so that the lighthouse gives a group of two, three, four or more flashes at short intervals varied by periods of darkness. By means of the superimposed or bi-form lens, each lens having a separate burner, the power of the beam can be increased. Most lighthouses have a landward sector where the light is not needed, and the light from this are can be used elsewhere, being reflected by glass prisms to a point where it is needed as a subsidiary light. A number of lighthouses have a subsidiary light that shows below the main light and marks some particular reef or shoal. The rays of light are reflected vertically down the tower and out horizontally through a window. The classification of the lights is decided by the distance from the centre of the light to the inner surface of the lens, called the focal distance. The most powerful is the hyper-radial, with a focal distance of 1,330 millimetres or 52·3-in, the next being the first order, 920 millimetres (36·2-in), descending to the sixth order, 150 millimetres (5·9-in). By means of reflection and refraction (the bending of light rays) and the use of mirrors and lenses, science has made the lighthouse the wonderful beacon it is to-day. The revolving lenses are protected from the weather by an outer lantern of plate-glass reinforced in a steel frame. The revolving parts weigh up to six tons, and the problem of turning them with the least possible effort has been solved by mounting the apparatus on a mercury float pedestal. Friction is so slight that the whole is revolved by means of clockwork. For many years wick burners were used, but these have been superseded by electric lamps and mantle lamps burning vaporized oil. The nature of the illuminant depends upon the location of the lighthouse. The pioneer British lighthouse for electricity was the South Foreland, on the Kent coast. Now there are a number of electric lighthouses, but incandescent mantle burners using oil are better for isolated towers where it is not possible to lay electric cables from the shore and where it would not be convenient to install a plant for generating light. The electric lamps made for lighthouses are of high candle-power, as might be expected. The Eddystone is a lighthouse with a subsidiary light. The main light is 133 feet above high water and is a white double-flashing half-minute light, showing two successive flashes of one second duration, divided by an eclipse of five and a half seconds, the second flash being followed by an eclipse of twenty-two and a half seconds. The light is visible for seventeen miles. The subsidiary light, fixed white, is shown from a window 40 feet below the main light, to mark the Hands Deeps, a bed of sunken rocks upon which is a depth of 24 feet of water. The rocks lie three and a quarter miles north-westward of the Eddystone. The mariner is not likely to confuse this with the Lizard with its white light flashing every three seconds (flash one-tenth of a second) visible twenty-one miles and 230 feet above the sea. Nor will he confuse it with the Start, a white light with a flash of one and a half seconds every twenty seconds, the light being 204 feet high and having a visibility range of twenty miles. It has a subsidiary lower light to mark the Skerries Bank, a shoal north-east of the lighthouse, this light being 23 feet lower than the main one and fixed white; like the subsidiary light of the Eddystone, it shows over a certain arc and not all round the horizon. Two major lights of the Strait of Dover are the South Foreland and Cape Grisnez. The South Foreland, visible for twenty-six miles in clear weather, is 374 feet high, and has a white light flashing every two and a half seconds. Cape Grisnez Lighthouse, visible twenty-two miles, is 233 feet high and has a flashing white light, flashing every five seconds. RELIEVING A LIGHTSHIP. The relief of the Breaksea, stationed in the Bristol Channel, off the Glamorganshire coast. The vessel is painted red, and has a ball at the masthead. It gives one white flash, with a light of If seconds every fifteen seconds, visible eleven miles. There are also a fog siren and a submarine bell. The above arrangements are those at the time of writing, but as they are liable to alteration, lights must be checked for nautical purposes by the lights lists and notices to mariners. The timings of lights distinguish them. In daytime the lighthouse can be used by ships as a beacon to establish their distance off shore. The angle of its height above sea-level is taken with a sextant and the correction for the height of the observer’s eye is applied. The height of each tower is given in the mariner’s books; and tables of distances at which objects can be seen at sea according to their respective elevations, and the elevation of the observer, enable him to calculate his distance from the lighthouse. The improvements in lighting and mechanism have added to the responsibilities of the lighthouse keeper. Despite modern progress the rigours of duty in an isolated rock lighthouse are such that few men care to undertake them; keepers are still cut off from relief by prolonged storms. The keepers of a rock lighthouse lead a more cramped existence than prisoners, as in some lighthouses the lantern gallery and the landing platform at the base of the tower are the only spaces available for exercise. 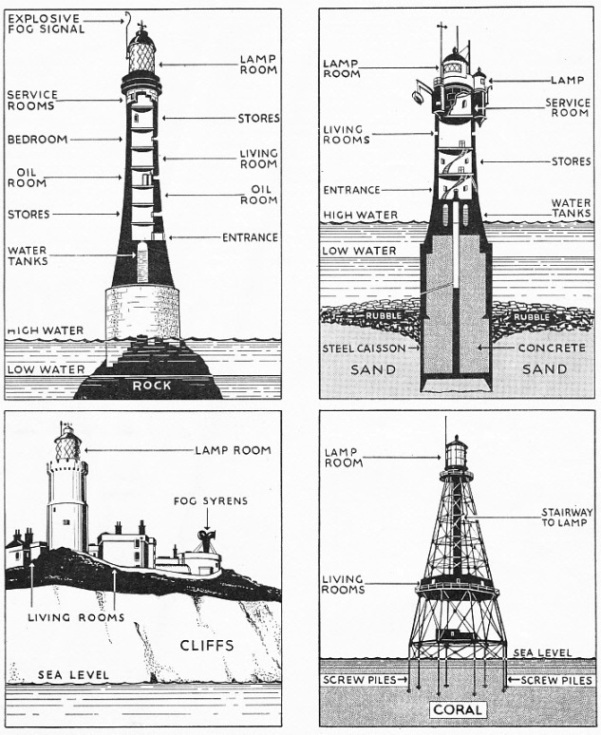 FOUR TYPES OF LIGHTHOUSE illustrated diagramatically. The top left picture shows one built on a wave-swept rock. Lighthouse of this type are the most expensive and difficult to build. The structure consists of the tower, the lens, with its supporting pedestal, burner and accessories, and the protecting lantern. In some places the lighthouse has to be built on sand. In this instance, instead of a tower, a steel caisson is sunk into the sand and filled with concrete (see top right picture). A well-known example is the Rothesand Lighthouse, built near the mouth of the River Weser, off the German coast. Lighthouses built on the screw-pile principle (bottom right picture) are used to mark sands and also as warning lights. 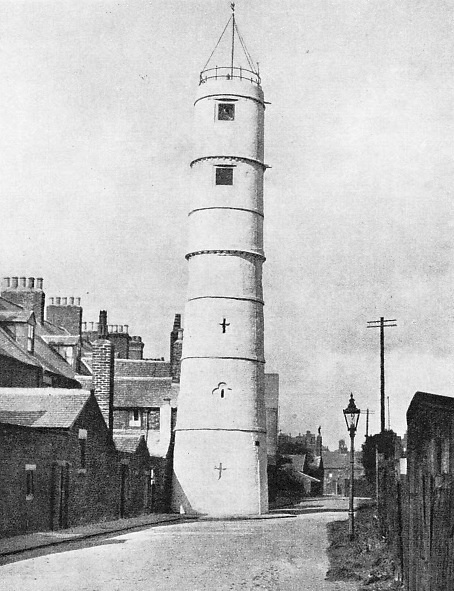 A pioneer of this type was the Maplin Lighthouse, which formerly marked the Maplin Sands off the Essex coast of the Thames Estuary. The bottom left picture shows a typical lay-out of a lighthouse built on a cliff, exemplified in the Lizard Lighthouse. The lamp is lighted at dusk and the clockwork is wound up. The light is watched and a look-out is kept for any sign of fog, when the fog-signalling apparatus is brought into use. In daytime the lamp is cleaned, and all the lenses and mirrors have to be kept highly polished, as the slightest trace of dust will impair the power of the light. Oil is pumped from the storeroom in the base of the tower to the lantern-room, and the clockwork mechanism is examined to ensure that it is in order. In winter the outer lantern has to be kept clear from snow, and during a storm the tower trembles under the impact of the waves. At one time it was customary to have only two keepers on duty in a rock lighthouse, but now the usual establishment is four men, three of whom are on duty while the fourth is ashore on leave. E ven this scheme is not infallible. 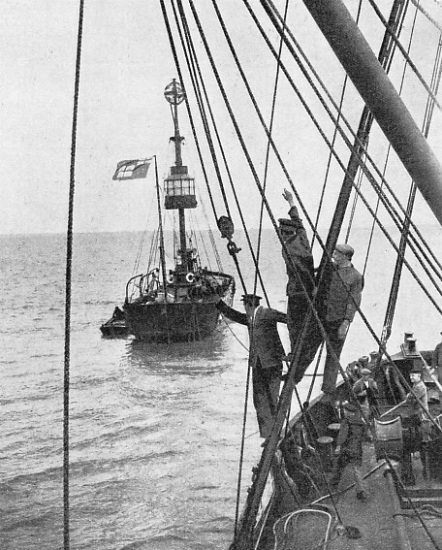 The Flannen Islands Lighthouse, fifteen miles off the Hebrides, was found deserted on Boxing Day, 1900. There was a staff of three keepers, but they had vanished. Examination of the logbook showed that the last entry had been made at 4 a.m. nearly a week previously; the lamp had burned itself out. It is thought that one man went on to the rock during a storm and was swept into the sea and that the other two perished when trying to save him. The most recent development is the unattended lighthouse, which is automatic. The Heugh Lighthouse, Hartlepool, is of this type and is electric, the light being switched off at sunrise and lighted at sunset by a patent valve. This valve consists of two glass bulbs, one black and the other clear, which are connected by a tube and are partly filled by liquid ether. When daylight arrives the black bulb becomes warmer than the clear one, and the pressure within it increases and causes the liquid to flow to the clear bulb, the extra weight tipping this down and causing the electric current to be cut off. When darkness approaches, the process is reversed and the liquid flows back to the black bulb, switching the current on. Power for the light is supplied by a cable, but if this should fail, a petrol generating-set is started, maintaining the light until the usual supply is restored, when the set automatically stops. If the lamp fails, a second lamp automatically comes into operation, and the change in current or lamp is signalled to the shore by means of a warning light which appears on the shoreward side of the tower. THE 500 mm. (19·7-in.) focus sextuple flashing optical apparatus is lit by two 3-kilowatt electric lamps, and has a candle-power of 12,000,000. It was made for Hartland Point Lighthouse, North Devonshire. The white group-flashing light shows six quick flashes in 7½ seconds; the visibility is seventeen miles. Unattended lighthouses lighted by gas are operated by valves working on similar principles; a black rod used in conjunction with burnished rods expands and contracts according to the light, and opens or closes the gas valve. Such “lighthouses are left safely for months in certain parts of the world. These automatic lighthouses, which are visited at certain intervals by officers of the lights service of the country concerned, have alleviated the hardships of tending lights on some exposed and isolated coasts, as they have no keepers who are marooned for long periods. But since the lighthouse is an outpost of civilization, the principal lighthouses on distant coasts continue to be garrisoned by men. The wilder the spot, the greater the need for a lighthouse to warn ships of the dangers of the shore in all conditions of weather. These dangers are augmented on some coasts by the savage nature of the natives, who regard a wreck as a gift from the sea-gods and are eager to murder any shipwrecked crew and plunder the vessel. They look upon the lighthouse and its keepers as enemies, and service at such a station is similar to garrisoning a beleagured fort. On parts of the African coast lighthouses have been built under military protection and guarded by forts and a garrison of soldiers. Lighthouses have been attacked and the keepers killed, but the houses have been manned- again and the light has shone forth once more. keeper complained that there was a devil in the lighthouse. He received little sympathy, but was told that, as no devil would annoy a good man, he was a bad man, and unless he reformed and the devil left him he would be discharged from the service. The devil promptly disappeared. Several Chinese lighthouses have been wrecked by earthquakes. Lighthouse keepers in lonely places are sometimes called upon to help ships in distress. They cannot neglect the light, but they frequently go to the aid of vessels in a boat, send a message to a settlement, or feed and house shipwrecked sailors until relief arrives. A 920 mm. (36·2-in) revolving optical apparatus for Eclipse Island, Australia. The light is of the first order. Its size may be gauged by the figure of the man standing alongside. The most dreaded enemy of the seaman in coastal waters is fog that blinds the lighthouse. Immediately fog descends the fog-signalling apparatus of the lighthouse is brought into use. Because of the effect of fog and the nature of acoustics, sound signals are not as efficient as the lantern. They have been greatly improved in recent years, however, and the sound range in calm weather is sometimes over twenty nautical miles; and as much as forty miles have been reported. Lighthouse sound signals are vital to small ships such as fishing craft, which, being without wireless installations, cannot benefit from radio beacons. A modern type of fog signal called the diaphone is now in general use. It is operated by compressed air and has a deep and penetrating sound at the end of each blast. The note is always the same, and can be regulated either to give a distinctive blast for the station or to signal by Morse code. The instrument consists of a piston that has a short reciprocating motion parallel to its axis in a cylinder into which it fits closely. The piston and cylinder have narrow circumferential slits cut in them, and the sound is caused by compressed air passing through these slits as the motion of the piston brings them opposite each other. The complete plant consists of the diaphone and its horn, the timing mechanism for giving the character of the blasts, air compressors, the power unit to drive them, the air receivers and piping. The type of power unit depends on the lighthouse. In one isolated on a rock the engine burns the same oil as is supplied to the burners of the lantern. I n distributing the sound, problems similar to those of distributing the light have been solved, and the resonator, or horn, varies in shape according to local requirements. If the sound is required to be distributed over a complete circle, the horn is vertical and is called a mushroom resonator. ON THE EAST COAST of England. 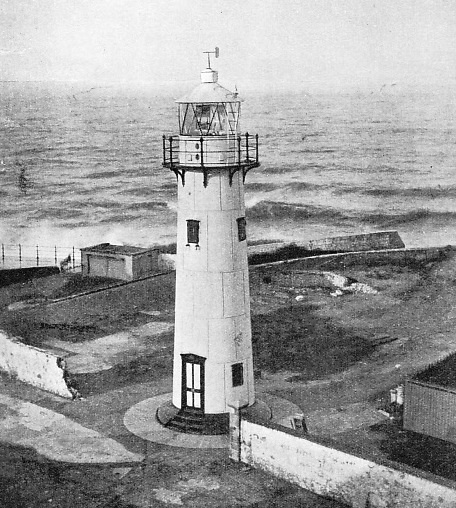 Heugh Lighthouse, Hartlepool, Co. Durham, has one white flashing light, showing two flashes of one second each, with an interval of two seconds between them every ten seconds. It has a visibility of thirteen miles, and is automatic in action, the light being switched on and off, at sunset and sunrise, by a patent valve. You can read more on “Buoys and Beacons”, “Day and Night Signals at Sea” and “Lightships” on this website. Follow this link to see illustrations from the Photogravure Supplement. You can read more about “Sentinels of the Sea” in Wonders of World Engineering.